Lawrence Hodges and Harlow Doyle uncover a bootlegger operation, but no one will believe Lawrence. Recreated from Officer Harley episodes, AIO70 and AIO71. The Barclays and Lawrence win a trip to Hawaii, but with one little snag; the Rathbones come along, too. Rodney tries to impress Donna for her love, while Lawrence tries to find his dad, who he hasnt seen for months. 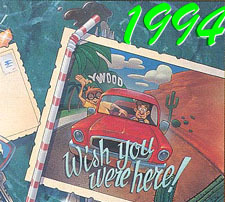 These episodes were made into an AIO Activity Pack, Aloha Oy!, Volume #12. Contains an Imagination Staition adventure. Eugene assumes that Katrina is dating someone else, so he tries to win her love with material things. Whit assumes Eugene and Connie are a couple. Excessive use of music from "Waylaid in the Windy City"
After losing his job, George Barclay and family are trying to cope with not having a regular paycheck. Jimmy and Donna pray for their dad to get a job, but get a very unexpected answer. Rusty Gordon (Malone) convinces Sam Johnson that to get noticed, he needs to bad things every once in a while. Jimmy Barclay is depressed after realizing that he hasn't taken school seriously enough. VERSION DIFFERNCE: Since this episode was so short, they attached a "AIO fun fact" at the end of the program, on the broadcast version only. Eugene is troubled with the idea of Katrina working at Whit's End since he is afraid she will become a Christian. Before he can do anything, however, Connie tells Katrina the Christian message and Katrina accepts it. Meanwhile, Lucy learns how the Bible room came to be. After accidently leaving a disk with his personal feelings in a place where Katrina might see it, Eugene urges her to "just stay friends", even though both of them love each other. See C. S. Lewis references. After seeing a dog at Whit's End, Donna decides she wants to adopt it. After getting an affirmative family vote, Donna finds out the many troubles of having a dog. After resisting for a while, Joe Finneman tells the story of how he rescued children in Vietnam. Danny works on preforming a piano piece for a Whit's End talent show, but finds that discipline interferes with many of his favorite activities. Jacob and Easu's lines over the sale of the latter's birthright sound very similar to Ursula's deal in The Little Mermaid. Eugene and Bernard take off on a trip to California. Eugene is going as an "expedition", to get out and explore the world. Bernard is going to get a new pickup truck. Bernard's radio starts to play the AIO theme. Bernard says "I wanted to hear the rest of that" when it fades out. There are no AIO episodes where only two named people are heard. This episode comes the closest with Eugene and Bernard being the only named ones heard for all but one line. At the beginning of this episode, a character named Dean is heard saying "See you, Bernard." During an unplanned stop in the middle of the country, Eugene and Bernard meet 13-year-old Graham, a boy who would do anything to get away from his farm life. Eugene and Bernard find themselves in the company of people who are very much like themselves: Eugene with some eggheads and Bernard with a criminal. Eugene and Bernard go on a mysterious search for treasure after being given a map. After finally reaching California, Eugene and Bernard are suddenly guests in a Hollywood producer's home. Eugene is even offered a screen test. Later...disaster threatens. See It's a Wonderful Life references. See Andy Griffith Show references. Upon returning from their trip, Bernard and Eugene find that an old friend has left Odyssey for possibly a long time. See this article to find out from where some of Whit's lines come. VERSION DIFFERENCE: The album version adds a horrible scene with Harlow after Connie slams down the phone. Harlow becomes convinced that Whit has been kidnapped. Apparently this scene was only added to the cassette version since the CD version doesn't include it. PARENTAL WARNING: This is a highly emotional episode. It may raise several questions about why Whit had to leave. This episode could be an opportunity to talk about death with your child. Recommended maturity level: 8 and up. Interestingly, in this episode, Jack says that Whit wrote him a letter to ask him to come and see him, but in AIO365:Clara, Jack says that he himself decided to come see Whit to apologize. Connie deals with the lose of their close friend, while having a hard time accepting a new one. VERSION DIFFERENCE: The album version adds more to the scene between Jack and Tom at the ice cream counter. In the broadcast version, Jack says, "Who do you think taught Whit?" and then Tom says, "Say Jack..." and asks him he could work at Whit's End for a while. In the album version, after the line "Who do you think taught Whit? ", Jack actually makes a cone with a "curly q" and then shows Tom how to make one. Tom says "Now the sad thing is that some kid will come along and eat it." "Life's tough," says Jack. It's a scene which really adds to Jack's character. The major problem in the broadcast version is that it is very obvious material has been cut out here. Tom's voice changes rapidly since he moved around in the cut scene. It was probably the best that Dave Arnold could do, however, without re-recording the voices. Jimmy Barclay attends a basketball camp with Phil, a kid who seems to know it all, but uses poor technique. This show was Marshal Younger's directorial debut. Katrina thinks her new student is very intelligent because she looks older than she really is. Connie and Eugene wonder how to tell Jack that his painting is "awful". Courtney's election is sabotaged by the theft of her notebook of speeches, poems, and diary entries. Jimmy, Donna, and Mary observe the constant pressure on soon-to-be preacher George. To remedy this, they take him out for a picnic. Tom and Bart run against each other after the mayor of Odyssey resigns. Philip Glossman shows up to try to condemn Tom's Apple Farm with an environmental scam involving the Edgebiter Chemical Company. As evidenced by the mayor's phone conversation, Blackgaard's ties to people in Odyssey must have been very deep. As evidenced by Glossman's phone conversation, Tom becoming mayor must have been a major problem to Blackgaard's bigger plan. A Kids' Radio broadcast about the dangers of drug addiction. Contains a KIDS Radio broadcast. Jimmy thinks the congregation at church is calling him to become a preacher, so he decides to follow their calling, until his Dad helps him learn to discern God's calling from others calling. Also, Donna is embarrassed by her dad using childhood stories for church sermons. Jason Whittaker, on his last mission for the National Security Agency, helps Tasha Forbes fight Mustafa and Red Scorpion to stop the threat of global biological terrorism. Meanwhile, Dr. Regis Blackgaard shows up again seeming to be on the "good side". I've really wondered about the violence level in these two episodes. In The Complete Guide to Adventures in Odyssey, Phil Lollar reveals that back in AIO40: The Case of the Secret Room, Part 2, they removed a gun from a scene to "dispel potential audience fears about violence". However, in these episodes we have people spraying others in the face with knockout gas. Mustafa clicks a gun into place at Jason, and then he intends to inject Jason with a deadly virus and then actually seems to do it to Dr. Blackgaard who falls seemingly dead on the floor. In the confrontation in the park while Mustafa holds Tasha hostage, we hear Abdul pull out a knife, seemingly to threaten to kill her. Then we have lines like, "I can still shoot her from across the room" and "Let's us see how humorous you are with the virus coursing through your veins." Not that I think that any of this violence is too much for AIO. I just wonder why they didn't put a quick little, "Parents listen with your children on this episode" on the beginning. GOOF ALERT: In the final scene of this episode, Mustafa injects Dr. Blackgaard with a syringe that (he thinks) contains the Ruku virus. Dr. Blackgaard falls to the floor and "dies" in a few seconds. Viruses simply do not work this way; it takes time for viruses to infiltrate the body and destroy it. The most deadly viruses that are known to exist take days to kill a person. It simply could not happen in a few seconds. Major poisons could kill a person that quickly, but a virus could not. Now the obvious explanation is that Blackgaard did not really die. However, there was at least one person there who should have realized that Blackgaard could not have been killed that quickly by a virus  Tasha Forbes. Tasha is a molecular biologist and had spent years working on the virus. She should have knowns that something was very fishy when Dr. Blackgaard died that fast. Another interesting side issue deals with Dr. Blackgaard's actual death scene in AIO334:The Final Conflict. He says that "somewhere along the line, he picked up a strain of the Ruku virus". Now that is an interesting statement. In A Name, Not a Number, Part 2, Dr. Blackgaard tells Mustafa that Abdul had filled the syringe with a vitamin complex which was completely harmless. However, in AIO329: The Return, he tells Jason Whittaker that he was injected with a strain of Ruku virus that had been exposed to air. "It was enough to make me very ill, even to simulate death, but not to kill me," he says. Wait! What about the vitamin complex that Abdul put in the syringe? Of course it's possible that Blackgaard was lying to Jason. After all, if he told him that Adbul was working for him, it might lead to awkward questions about Mustafa's death. However, if the first explanation is correct, we are still left with the question where did Blackgaard get the Ruku virus? We never get the hint in any of the Darkness Before Dawn episodes that Blackgaard has made any Ruku virus with TA-418, which would make it possible to catch easily. So if none of the "enhanced" virus was made, Blackgaard had to get it from an injection since Tasha said in A Name, Not a Number, Part 2, "the only way to get the virus is to have it injected directly." Who gave Blackgaard this injection and when did it occur? We may never know. An O.T. Action News report on the taking of Jericho. Contains a KIDS Radio broadcast (O. T. Action News). Jason and Jack find a book from the old Isrealites meetings. They go off in search of clues about the Isrealites, and run into an old member named Billy McPherson. Jimmy decides to produce a Christmas radio drama and uses his family and friends to do it. At the end, Mary finally has the long awaited baby! Jason Whittaker adjusts the Room of Consequence so its user can become part of a soap opera. Contained a Room of Consequence adventure.